It's interesting to see cities are getting smarter and turning the outdoor advertising business model of bike-sharing on its head. 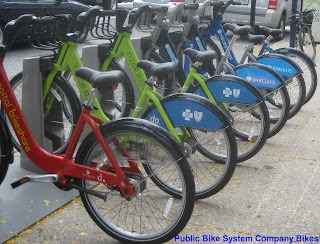 Instead of cities doing a public tender for an outdoor advertising program and getting a "free" bike-sharing service, the trend is to now to do a public tender for bike-sharing through a bike-sharing service contract and getting it for free. It keeps things simpler and the revenues cleaner. Pedal hard, Vancouver! 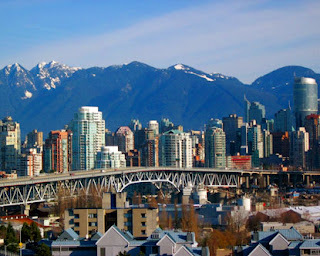 The service should be up and running in time for your hosting of the Velo-city Global conference in Spring 2012. We all know that one feels like royalty while bike-sharing. Now the Royals will also know that feeling too. London Mayor Boris Johnson gave a special tandem "Boris Bike" to Prince William and Kate Middleton as a royal wedding gift. We understand that, not standing on ceremony, the Royal Couple will pay £2 a day rather than the normal £1 a day for casual use! The special built 7-speed tandem was made by Cycle DeVinci, the company which makes the bicycles for Public Bike System Company, the suppler to London's Barclays Cycle Hire. It was commissioned by SERCO -- the system's operating company. 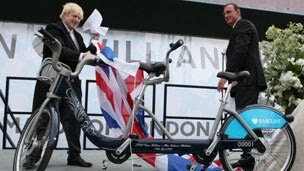 Mayor "Boris" presented the bike as a wedding gift from the people of London during an open air ceremony at Trafalgar Square this morning as many "Boris Bikers" watched the royal procession on a giant video screen. This afternoon Boston signed the deal to bring bike-sharing to the Massachusetts Bay Area. With the goal of making a regional system, Boston will start Hubway, the name of its bike-sharing service in July with 600 bikes in 61 stations. The neighboring Cambridge, Brookline and Somerville communities are expected to join Hubway within the year and other communities to follow soon thereafter to ultimately have 5,000 bikes throughout the region with 300 stations. 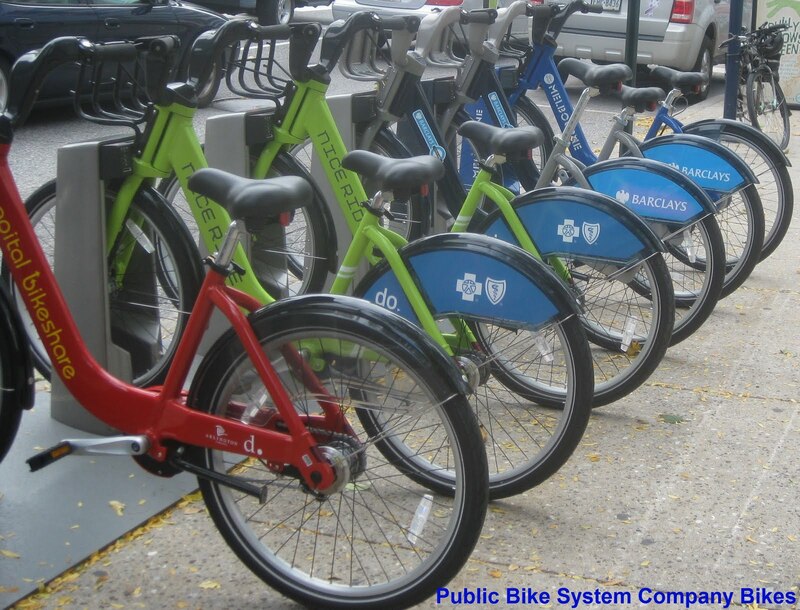 The system will use the Public Bike System Co. equipment, the same as in Washington, DC; Minneapolis; London; Melbourne; and Montréal. It will be operated by Alta Bicycle Share of Philadelphia which also operates the Washington, DC and Melbourne, Australia programs. The yearly subscription membership is pegged fairly high, at $85 which is $25 more a year than the comparable Nice Ride Minnesota and $10 more than Capital Bikeshare. The daily fare for casual users is the same as Minneapolis and Washington at $5. The Boston-area athletic shoe company, New Balance, will be a major sponsor and has retained the naming rights to the system, according to a City of Boston press release. New Balance Hubway should be an interesting name for bike-sharing service considering bike balancing is a major element of every service. On April 15th, with the approval of the Parisian City government, a revised rate structure for Vélib' begins with many good additions. The current annual subscription of 29€ ($41.50 US) with the first 30 minutes free each time the bike is used remains the same. A new 39€ ($55 US) subscription with 45 free minutes instead of 30 free minutes will induce suburban users to ride longer to work, school, or even further into the city. There is an advantageous subscription for young people under 26 years of age which gives them 45 minutes free instead of the 30 minutes free, but at the same price of 29€ per year subscription. Also there is a new scholastic tariff for students under 26 years of age which affords them a discount of 10€ off the price of a regular annual subscription. A new "formula touristic" allows people holding a credit card without a "chip" (that is most North Americans) to register online or at certain outlets (hotel, tourist office, etc.) in Paris for the 1-day or 7-day pass. The single 1-day pass is now the same price as a single one-way Paris Metro or bus trip 1.70€. This is excellent pricing for making an effective cost connection between bike-sharing and other forms of public transit. The 7-day pass is 8€ ($11.50US). The Vélib' web site will be more user-friendly making it easier to subscribe for all levels, from daily to annuals, online and for users to find locations to activate memberships and download maps. With almost 100,000,000 Vélib' trips since July 15, 2007 this programs success has been priceless. With in the next week, both Montréal' s bIXI and Minneapolis' Nice Ride will be back on the streets after hibernating for the winter. Nice Ride plans on starting its second season on April 11 with eight new stations in north Minneapolis and plans to have 100 stations this summer to include service in downtown St. Paul. They are offering a great way to shake off the cold Minnesota snow with a special limited time $40 annual subscription sale that is $20 off the regular price . bIXI will open its 400 stations in Montréal on April 15. The last few weeks have seen the stations back in places all over their service area. Five new stations are planned for an expansion of the system into Westmount this season. Les Montréaleurs are ready to roll. Capital Bikeshare, however, has beaten winter by rolling throughout the cold months creating scores of winter weather warriors. The Bike-sharing Blog has its finger on a scoop that no other media outlet has been able to obtain. Forty-six years after the innovative concept of bike-sharing was first created, the fourth generation of bike-sharing has finally arrived! No more smartcards, mobile phones, or keys are needed with this new technology as all it requires is a chip which is implanted into the customer’s skin. Germany’s Call a Bike system is taking advantage of Canada-based Melanin, Inc.’s high-tech innovation, the IntelliFreckle. 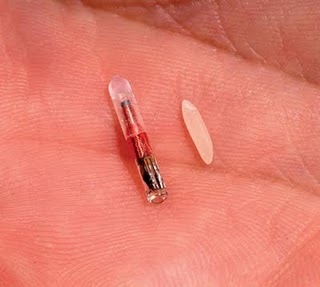 The IntelliFreckle is the size of a grain of rice and can be inserted under a customer’s skin through a painless air pump, found at each station. Deutsche Bahn, the provider of Call a Bike is the first to integrate this biochip into its service to be used in 68 cities where its offerings are already in place. The new service is to be called “Rub a Bike”, named after the action a customer with the biochip must do in order to rent one of the fleet’s bicycles. To unlock a Rub a Bike, one must rub the body part with the inserted chip directly over the RFID reader on the dock in any stand where a bicycle is parked. A thumbs up image is displayed on the dock with five seconds of the 1984 hit tune “99luftballons” played from speakers on the bike which will signal to the customer that their identification has been accepted and the bike is ready for use. Happy April Fools’ Day from The Bike-sharing Blog! This blog post is a joke, but probably will be true someday.